1100 years ago, long before the Normans got anywhere near the English coast, one of the daughters of Alfred the Great commandeered a small settlement in the Midlands. 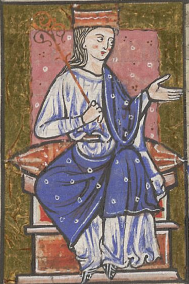 Æthelflæd, Lady of Mercia, ordered the fortification of the settlement and the construction of a new burh (borough), which became a pottery production centre. It was called Stafford, because it had a ford by a staithe (a landing-place). I think that’s pretty awesome, actually. Not only to live in a place which has such a long history (going back at least 200 years prior to Æthelflæd’s orders), but one which was established by a woman. Æthelflæd’s brother inherited his father’s role as King of the English in Wessex. She married the Lord of Mercia, and ruled there in her own right for 8 years following her husband’s death, although even while he was alive, she was the one who led the troops. Together with her brother, she attempted to unify England for the first time (at the time there were four kingdoms: Wessex, Mercia, East Anglia, Northumbria). They didn’t succeed. The Council have decided to celebrate the 1100 years of the town’s history with a concert featuring Matt Cardle. That would not have been my top choice. But still, it’s worth celebrating, I think. And Æthelflæd is definitely worth remembering. When I am granted my hereditary peerage*, I plan to become Rosalind, Countess of Mercia, in her honour. *You can make it happen! Simply write to David Cameron and tell him why.